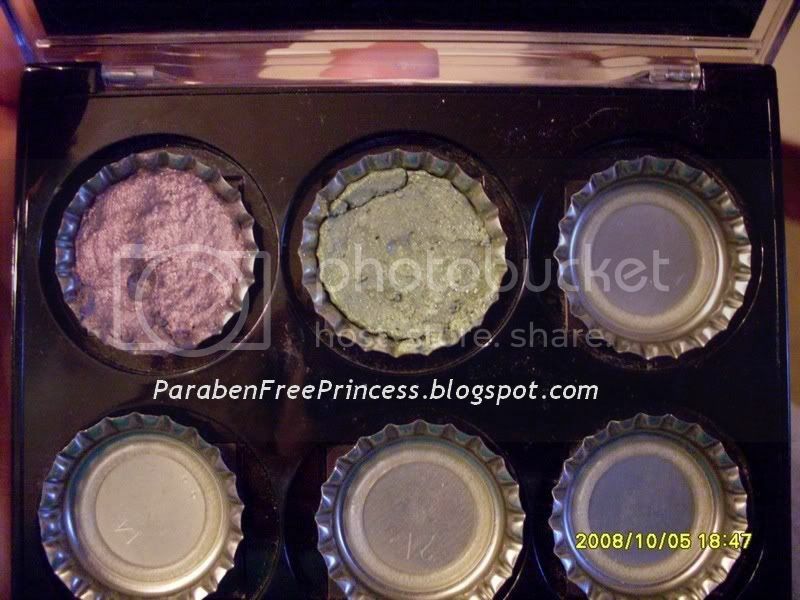 I had a reader ask a question about pressing my Simply Naturals eyeshadows I did a haul on. I pressed several of the BlackStar shadows and they are just gorgeous and rich. A couple of them fell apart on me when I used them, but I think that was due to my pressing skills and not the product. Instead of buying eyeshadow pans to press in, I use bottle caps. I think I am the only person on the planet currently using these. Sounds crazy, but metal bottle caps make great pans, fit in most magnetized compacts and are very sturdy. You should be able to find these in any craft store - or from any friend who drinks bottled beverages. Be sure and wipe them out with alcohol regardless of your source. You can use just about any liquid to mix. I haven't found that one works better than the other. Alcohol, Vodka, Mixing Medium (3 parts water to 1 part glycerin). I used Witch Hazel on the two pictured here, which I have been using a lot. I think the secret to success is more in the mixing and pressing than the actual liquid. I use an empty mineral eyeshadow container. I put a few drops of liquid in and then a scoop of eyeshadow. I mix it up with a small, stiff makeup brush, scrape it into the cap, tap it down and repeat until the cap is fairly full. After it dries for a few hours, I use a quarter (be sure to clean it with alcohol as well!) to press. A quarter fits perfectly into a bottle cap. When you put the liquid and the eyeshadow in the pot together to be mixed, the liquid will usually bead up and not mix with the powder. Take your mixing brush or stick and dig at a particular spot in the mixing pot. This will keep breaking the bubble and mixing the powder in, you will start to notice a creamy consistency. Once it starts mixing, scrape around the sides like you are mixing cake batter. Always make your first attempt with a sacrificial eyeshadow. Remember that even if your pressed shadow falls apart or the entire process fails miserably, you can always let everything dry out and try again, or just keep using them unpressed. Below is an excellent video from EnKore over at You Tube. He has done several videos this year on pressing pigments, but this one is the best and has very good reader comments which are helpful. Direct Link to Koren's video.